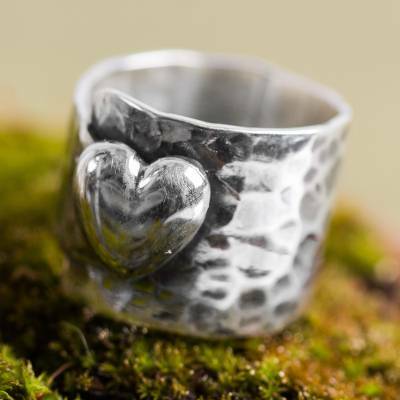 You can find sterling silver cocktail ring 'Heartfelt Hug' by Carolina and Jorge in jewelry categories such as Heart Shaped Rings, Romantic Rings, No Stone Rings, Silver Rings, Sterling Silver Rings and Cocktail Rings. Enjoy exploring these sections for other Novica treasures. "We love the art of making jewelry because it is a form of communication: we transmit something through our designs, and our customers seem to understand the story or the emotion." "We're Carolina and Jorge, a couple of young artisans with many projects in mind and we're ready to share our art. We sign our work as Llul, a term we adopted when we first started which we thought meant 'jewel' in English! We were taking part in a handicrafts project in Cajamarca sponsored by the American Peace Corps and most of the volunteers hardly spoke Spanish, so when they said jewel we heard llul. "Now people are getting to know us as Llul and identify it with high quality jewelry that is expertly crafted with our heart and soul. "I, Carolina, was born in Lima but my family is from Japan. My designs are influenced by Japanese artistry, where I mix geometric and organic motifs. I grew up in Lima and since I used to swim when I was in school, I got the chance to travel throughout Peru. This is how my fascination with the Moche, Chimu and Inca cultures began. "I, Jorge, grew up in Trujillo and when I finished school I started working at my dad's small ceramics workshop. I then studied fine arts, followed by graphic design and painting. I've enjoyed handcrafts and modeling ever since I was a boy – I used to spend a lot of time looking at my dad's books and magazines on architecture and design. I still have them and once in a while I like looking through them." "For me, Carolina, it was difficult to leave it all, my work and my family, to pursue what impassions me. But soon enough the results reassured me. I moved to Cajamarca in 2008 and everyone thought it would be a temporal thing. But my family stood by me and to this day I carry with me everything my parents taught me about loving what you do and being disciplined about it. "My original plan when I went to Cajamarca was to finish in one year the jewelry course I'd be taking, which was designed as a year and half, because I didn't want to stay in Cajamarca for so long. I didn't think Cajamarca would be an interesting place to live in… and that was eight years ago! I'm still living in Cajamarca and would not want to live anywhere else! "For Jorge, studying art and making a living of it back when he started was very complicated – especially when people where prejudiced against artisans. However, he feels that had it not been for those challenges, he would not be enjoying now what he has achieved. And though his family didn't agree with the choices he was making, they always supported him." "At the end of the day, being able to work doing what you like is always rewarding, and these are rewards that feed your spirit and give you the strength to carry on," admits Jorge. "We both have many dreams to fulfill, such as continue working in what we love, share our designs and grow as a venture so that people will eventually recognize our style and our collections. "We worked hard to learn this art form, we took different specialization courses – Jorge even went abroad to study – and we've had work experience with different Peruvian master jewelers at their workshops. The more we learn, the more inspired we become and push ourselves to continuously improve. "We both share a passion for jewelry design as well as for our ancestral cultures and in 2009 we reached the finals in the IV National Handcrafts Competition, in the section for rescuing Inca techniques and symbols based on the cave paintings in Cajamarca. "We mainly work with sterling silver (.925), trying to contain the environmental impact our work may have by recycling as much as we can. Everything is crafted at our workshop to ensure high quality products. We do everything, from melting the silver, to making the sheets, soldering, crafting and the finish. "We love the art of making jewelry because it is a form of communication: we transmit something through our designs, and our customers seem to understand the story or the emotion. In that way, our jewelry becomes a part of the customer. Jorge refers to our designs as 'wearable art' and he's constantly challenging himself to out-do himself. "Inspiration comes to us from different places, be it the natural and architectural beauty of Cajamarca, which can be reinterpreted over and over again. Or it can come from our childhood memories, sci-fi films and museums. Everything we see and surrounds has the potential to inspire us. "Not only do we share a workshop and an art form, we also share our points of view. As designers, we're constantly offering our thoughts on what the other is doing with the utmost respect for their individuality. This enriches our work and as we concentrate our work on what we specifically like. For example, I prefer making earrings and jewelry sets whereas Jorge prefers to work on rings. "This is very beneficial for us, because we can easily work together on a design, or create one individually as we respect each other's creative space." As always when I purchase from Novica, I was so happy with these earrings. They are just beautiful and I will wear them all the time.